It’s meanwhile almost four decades that God has lead us in the true sense of the word a miraculous path ... and it hasn’t changed until this day. 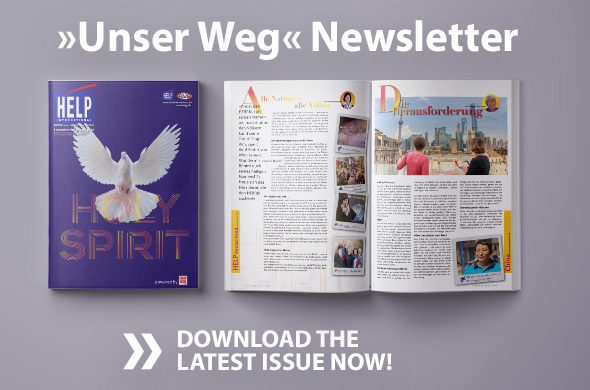 With each edition, Unser Weg talks about miracles, stories, impulses in our lives as well as in the lives of people we are walking alongside with – or to put it as Psalm 22 says – “... we praise God in the great assembly”. Thank you very much for your friendship and moving on with us. Thus, Unser Weg is not just a magazine or newsletter, but rather sharing in our experience with God and with one another. "HE is a fascinating and inspiring person, gentle and powerful alike, fire and water all in one, both intimacy and authority, liberty and joy, life and fullness. The Holy Spirit is the active power of God in person. May you encounter HIM while reading the pages of this newsletter and become overwhelmed by the person of the Holy Spirit. You are welcome to live with us short- and long-term and to encounter the Holy Spirit in a deeper dimension in our communities in Germany and the nations."